Navras नवरस نورس נברס: Is One of the Lost Tribes the Taliban? 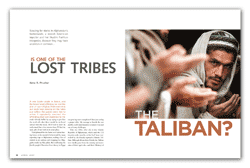 Is One of the Lost Tribes the Taliban? It was Seder night in Kabul, and the bread most afflicting me was the pile of nan - Afghan flatbread - that our cook kept placing on the table just before the guests were due to arrive. I repeatedly removed the offending plate and explained to the cook - already baffled by my trying to give him the week off - that there would be no bread served with this meal. He’d nod to show he understood, but a few minutes later, I’d find the same pile of nan back in its usual place. I had planned for this Seder even before leaving home on the second of what would be many reporting trips to Afghanistan, tucking a box of matzah in my suitcase and wrapping two Haggadot inside my flak jacket. But celebrating the Jewish people’s liberation from slavery in Egypt was proving more complicated than just setting a proper table. My attempt to banish the nan and the cook’s determination to return it was just one of many challenges. This was 2002, after all, in the Islamic Republic of Afghanistan, which until the U.S invasion only months earlier had been controlled by the fiercely repressive Islamist Taliban. Although driven from Kabul, the Taliban were hardly gone from the country and memories of their rigid rule - and their Ministry of Virtue and Vice - were fresh. A colleague who was co-hosting the Seder and I dared not reveal to our Afghani staff and guests - interpreters, drivers and guards - that they were actually helping us observe a Jewish holiday. Instead, we related the Passover story in metaphorical terms: Just as you here in Afghanistan are celebrating your freedom from the oppression of the Taliban and the terror of civil war, we commemorate the day of our freedom from slavery. This is a feast to show our love of liberty, our thanks to God. The Afghanis ate it up - and reached for seconds of my charoset. The only guest in on the secret was my guide and interpreter, Mashal, a member of Afghanistan’s prominent Pashtun people. Gentlemanly son of a judge, author of two books of Pashto poetry and master of four other languages, Mashal had been running an Internet café in Pakistan soon after 9/11 when a colleague of mine coaxed him into journalism. A few days before the Seder, I found myself in an unexpected conversation with Mashal. He and I were on one of our long car trips through the ragged slate-gray Afghan hinterlands, scouting stories about Al Qaeda’s evasion of U.S. forces and local warlords who were besting America’s plans for the region. Somewhere between Khost and Kabul, Mashal raised a subject I had considered best to avoid in these precincts. “What?” I asked, as if I hadn’t quite heard him, buying more time to think. I knew there were peoples, from remote pockets of Africa to the far corners of East Asia, who believe they are descended from the Israelites. I had not, though, heard this mentioned in regard to the Pashtuns, who claim a proud martial history in Central Asia that long predates Islam. Also called Pakhtuns or Pathans, they are the largest ethnic group in Afghanistan, whose populace also includes other Muslim groups like the Hazaras, Tajiks and Uzbeks. More notoriously, Pashtuns make up the ranks of the Taliban. Was I to believe that the likes of Mullah Omar - the Taliban luminary who ordered public executions and floggings, made burka-wearing law, and gave succor to Osama bin Laden - possessed even a molecule of Jewish ancestry? “We have all kinds of traditions that no other Muslims have,” he said, “like Saturday was the rest day. And many of the words in our language are not related to any other language in the region. And I, I think maybe that’s because they are from Hebrew!” Mashal punctuated that last word with a pleasing emphasis. His love of poetry had a way of seeping into the sweet rhythms of his speech. Mashal’s discretion confirmed my instinct that I could trust him. Still, such confidence was not to be given lightly. This was hardly two months after the murder of Daniel Pearl in neighboring Pakistan, an event that shook many intrepid reporters to the core. Suddenly, to not hide one’s religious identity seemed reckless. Like the thousands of landmines still embedded in Afghanistan’s parched landscape, Jewishness could be hazardous to your survival. Later that day, I gingerly walked over one such landmine-strewn plain of cracked earth, dry and gritty as nan. At regular intervals, we had driven past gaggles of bright fabric flapping flirtatiously in the wind. Tied to thin wooden poles in the ground, they looked from afar like sails attached to the masts of sunken schooners trying to catch the breeze and move on. Mashal said they marked graves, but I couldn’t see how that could be. I asked our driver to stop so I could take a photograph. He shrugged and obliged, telling me to watch my step. As I neared the poles, my feet crunching the dirt beneath me, I could see that Mashal had been right. The flapping fabrics were head scarves from women who had buried loved ones here, colorful signs of remembrance for those they mourned. Up close, I found something even more surprising: stones scattered on nearly every grave. A memory from early childhood rushed through my head—one hand in my mother’s, the other reaching down to place a pebble on my grandfather’s tombstone. I returned to the car in wonderment, retracing my footsteps as I’d learned to do in a land as rich in mines as more fortunate countries are in coffee beans. I asked Mashal what the story was: Why the stones on the graves? This was a peculiar Pashtun way of marking a visit to the deceased, he said. “But that’s what Jews do,” I told him quietly. In all my travels, I had never come across another people who preferred pebbles over flowers on a loved one’s grave. Less than an hour later, we passed through a typically poor village on the road back toward Kabul. Paint markings on some of the buildings caught my eye. They resembled five-branch menorahs. I asked Mashal what they were. “Do all the peoples in Afghanistan do that, or just the Pashtuns?” Iasked. “This is only for the Pashtuns,” he said. It seemed uncanny. Menorah…nars. They sounded as if they shared the same root. And unlike the Star of David, which did not originate with the Jews, the menorah symbol had never belonged to another people. Mashal and I raised our eyebrows and looked at each other. In the weeks that followed, we were to come across further peculiarities of Pashtun customs that would ring familiar. There is the tradition among many rural women, for instance, of lighting candles on a Friday. They then hide them in a basket - perhaps to conceal their glow from censorious mullahs. There are wedding customs: Some Afghans marry under a cloth that is similar to the chuppa. Another Afghan cloth, the uniquely Pashtun shoulder drape for men that doubles as a ritual prayer mat, is called a tolia; Both its name and function, I told Mashal, reminded me of tallit. From then on, Mashal and I made a point of paying visits to Afghanistan’s Jewish sites: Gardez, where it’s rumored that a Jewish warrior named Gabur built an ancient fortress; Ghazni Province, where Pashtuns make pilgrimages to the tomb of a “Jewish saint” called Zikria; and Balkh Province, an ancestral area and possible cradle of Pashtun culture that once boasted a large Jewish population that disappeared long before the country’s other Jewish communities in Herat and Kabul dwindled after 1948 and died out in the 1970s. Mashal thought the Pashtuns might have acquired their name from Balkh pronounced pakh-tu by most Afghans. There are several stories about how the Pashtun people—spread throughout Afghanistan, Pakistan and India—came by their Jewish roots. Many Pashtun, Mashal pointed out, believe themselves to be descended from a legendary figure named Qais Abdu Rashid, who might have been from one of the Israelite tribes. Another theory is that Pashtuns are descended from Pithon, a tribal descendant mentioned in First Chronicles, 8:35. Curiosity piqued, I spoke to experts and consulted every book I could find on Afghanistan and the lost tribes. It seems Mashal and I were far from the first to wonder. One can find Muslim and Jewish references from the 13th to the 18th centuries attesting to the presence of lost tribes of Israel in the Pashtun territories in Afghanistan and Pakistan. These include the 1612 classic called Makhzan-i-Afghani, which was translated into English in the early 19th century as History of the Afghans. Hardly a contemporary academic or journalistic work - from Sir Olef Caroe’s The Pathans of 50 years ago to the most recent histories of Afghanistan - fails to mention it. British colonial official Mountstuart Elphinstone, writing in the early 19th century, compared Pashtu to Hebrew in his book, The Kingdom of Caubul. Israel’s second president, Yitzhak Ben-Zvi, believed in the Jewish lineage of the Pashtuns, as did Zahir Shah, the last king of Afghanistan. Once, when asked about his ancestors, Shah claimed that the royal family descended from the Tribe of Benjamin. Jews I spoke with who had grown up in Afghanistan also immediately identified with Pashtun-Jewish links. Their parents or grandparents, they would tell me, had always said, that of all Afghan peoples, they could expect Pashtuns to treat them well on account of their shared heritage. In Jerusalem, I met with Rabbi Eliyahu Avichail, founder of Amishav (“My People Returns”), a group that brings supposed descendants of the lost tribes - such as the B’nei Menashe in India and the Shin-lung in Burma - to Israel. He flipped to the map on the back cover of his book, The Tribes of Israel, and with his finger traced for me the tribes’ putative path from Palestine into Iran, eastward across Afghanistan, and eventually into India and China. Avichail’s claims brought to mind other intriguing details that Mashal had mentioned like some of the provisions of the complex Pashtun code of ethics, pashtunwali, which have no apparent connection to Islam and are not shared by other peoples of the region. These include exacting standards for hospitality and the requirement that a man marry his brother’s widow - a stipulation also found in the Torah. Recently, I had a long phone conversation about Pashtun origins with Dr. Navras Jaat Aafreedi, an Indian historian on a research fellowship this year at Tel Aviv University. He’s been studying Muslim groups in India that have traditions of Israelite descent. In one - a Pashtun tribe called the Bani Yisrael - everyone shares the last name of Yisraeli. According to Aafreedi, they believe that they are the descendants of a Jewish sahabi (“friend” in Arabic) of the Prophet Mohammed. Tudor Parfitt, a British professor of Jewish studies and author of The Lost Tribes of Israel, subjects the lost tribe theory to an unforgiving academic light apparent in his recent book’s subtitle: The History of a Myth. Parfitt argues that the last traces of the 10 northern tribes, who were exiled into Assyria and forced to assimilate, are Hebrew names recorded in Assyrian army documents from the 7th century. He has concluded that this is where the history of the lost tribes ends, and the myth of the lost tribes begins. A perfectly reasonable explanation for the cultural overlap, according to naysayers, is that large numbers of Jews lived and traveled in the lands that are now Afghanistan well before the arrival of Islam. As far back as the 7th century, Chinese travel writer Hsuan Tsang noted a large number of Jewish communities there. Eventually, most converted to Islam. Whatever the arguments for and against, many Pashtuns - my friend and colleague Mashal among them - remain convinced they are related to the Jews, or at least deeply curious to learn whether they truly are. Their belief has some interesting ramifications: In the ever-shifting power struggles among ethnic groups in this part of the world, the Israelite card is used both for and against the Pashtuns. Pakistanis in particular disparage the Pashtuns as Jews, while some Pashtuns use the possibility of Israelite heritage as evidence of having legitimate, ancient roots in the region. For the religious-minded, a connection to Judaism is proof of having been monotheistic even before the arrival of Islam. And unlike other groups that may or may not be descended from lost tribes, the issue isn’t about to get swept up into Israeli migration politics: the Pashtuns have no interest in emigrating to Israel. At my nan-less Seder this year, I will recall how Jews, as the descendents of the Israelites, have probably wandered more than any other people. Deuteronomy 10:22 tells us that, before slavery, “Your fathers went down to Egypt seventy people, and now the Lord your God has made you as numerous as the stars of heaven.” Where those stars shine today is anyone’s guess. Ilene R. Prusher is a staff writer for The Christian Science Monitor, and is the Boston-based newspaper’s Jerusalem bureau chief. She has spent the last decade reporting from countries throughout the Middle East, East Asia and Africa. Her articles have also appeared in publications such as the The Washington Post, The Philadelphia Inquirer, The New Republic and The Jerusalem Report. As a university student in New York (Columbia University) studying religion with a particular interest in both India and Judaism, I am writing my senior thesis about the lost tribe Israelite communities in India. I was very excited to come across your name and story while searching online, as it seems that you have done extensive and important work on this often neglected topic. I have been looking for you for the past 5 years. I knew through the internet that a genetic test had been done by our people in india, I did not whom exactly to contact, till now. To explain how I can help with your research, and as to who I am and why our goals are the same, I request you to contact me by email, I cannot post the details on a public forum. Please email me, I can give you my phone number and all contact details to verify that I have a legitimate role in your research. I request you to email me, I will explain everything.